Took a trip last year to McBride gardens in Kauaii and saw this beauty. Just a spectacular minature palm. Since then, I've read that only about a dozen are left in their original habitat, although other populations have been established. RLR's book states that it can survive 10b locations, but I rarely hear it discussed. Anyone growing it? (At the risk of being presumptuous, I suspect Bo has a grove of them! ) This plant was in full sun, and there seemed little special care was given it. But as you can see, it was in full seed. Oh yeah, I want one.....or several. That's OK, you can be presumptuous! Yes, I do have a little grove of these. Well, actually two little groves, one that's out in full sun and exposed to the wind, and the other one that's in a location where the palms are protected from wind, and also in partial shade. 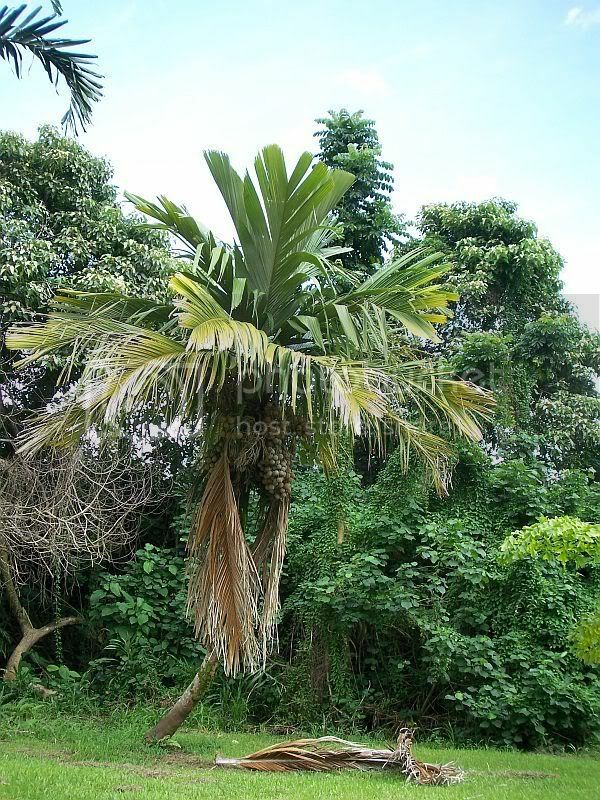 These palms have, at times, been next to imppossible to acquire at ANY nursery here on the island, obviously related to when seeds were, or were not, available. I remember when I first moved here 11 years ago, and visited Palms of Paradise nursery in Hilo. They had an enormous Pelagodoxa in something like a 50G or 60G pot. It was probably at least 17-18 ft tall. They wanted $5,000 for it... They never sold it, and it was actually planted at Jerry Hunter's (the owner of the nursery) place above Hilo a year or so later. Anyway, none of mine have started to produce fruit yet, but hopefully soon. Here's a shot of a few of the ones in the "protected" group. I'll try to get some more photos later today. I remember that palm from the garden when I visited, too. I think of it almost every day- so nice. The fruit seemed so unusual to me! It's one of those palms that really stands out to me when I think of a "choice" palm. Of course I know that most anything I see in Hawaii is a no no in my area...... Can't wait for my trip back there in February! This time I'll bring a lunch with me to the garden, if you know what I mean! Did you get any seeds on your trip??!! What a great picture of a mature palm. Down here in South Florida ( Ft. Lauderdale-Miami), this is a risky palm to grow outside. There's a big one at Fairchild Garden, in the conservatory. It is fruiting now.Outside, a couple of 30 degree nights might be enough to do it in. Back in the early 1990's, I made a trip to Tahiti with a good friend of mine in search of these palms. Our initial plan was to fly to one of the outter islands where there are a few still growing in habitat. But then we found out that the flight was an additional $700 each and we could not swing it. I just plantd one 2' tall this past summer behind my pool. I'll take my chances,and if I loose it, so be it. The ones at the palmetum are doing just too fine with no protection. It is their sixth year outdoors. That's on the coast, where everything is possible. But, I killed one of mines (1,5 years old) which was a bit inland, after a few weeks of 10-13 C min and 16-21 C max. It died in the same place where breadnut trees, coconuts and cacao can survive. Maybe too young. I actually snagged a handful from the ground; along with an additional 10 lbs. or so of various other palms..I was trying to be as inconspicuous as possible when boarding the bus with all 4 pockets bulging! Although I had good success with most of my collected seeds, unfortunately the Pelagodoxa was not one of them. I'd never even heard of them before then, but it was just so striking! Did not realise Miami and areas got so cold,so to worry this palm, I see now why Fairchild's is situated in the greenhouse but I have got to say though it does not look a pretty site though even with the perfect formed wind free leaves..........bigger greenhouse perhaps. ??? From what I've heard about these guys is thatthe seed is near impossible to germinate. I would love to have one of these but aren't they tropical in their requirements? Anyways, I'm just happy to have a seed for conversation. I havn't found Pelagodoxa seeds all that difficult. I bought 100 seeds from Ortanique early this year, and one annoying aspect is that they germinate sporadically. A few now, a few more next month, etc. etc. Over the last 6-7 months, 40 of the 100 seeds have germinated, and I'm still hoping for a few more. But even if I don't get any more I'm already at 40% germination, which is actually better than I expected. A few more current photos. First, this is the under side of a Pelagodoxa frond with the sun shining on the top side. Neat pics. So that is the seed. Is there pulp? Did you clean it? I haven't had my hands on any of that one to see how they are formed. Just a bit curious. The individual above, BTW, is in the group that's protected from wind and it is also in mostly shade. The other group is completely exposed, and here's a group shot of some of them. There are more but they are not visible in this photo. A total of 9 Pelagodoxas are visible, even though one of them is tough to see; only the trunk is (barely) visible, to the right of the Pelagodoxa that's just to the left of the Metroxylon warburgii (all the way on the right)! 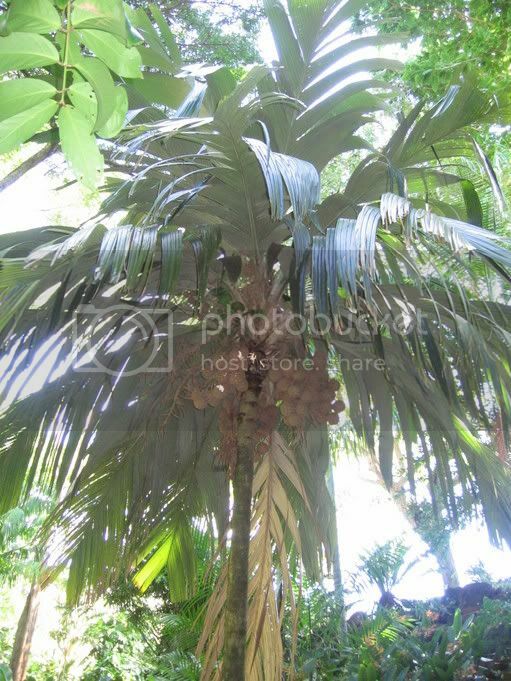 Hi all ;Yes it is a great palm, those photos are great. There seems to be at least 2 forms the one from Vanuata seems to be the more cold hardy of the 2, they are growing slowly on the sunshine coast and also in brisbane, seed germinates easy but must only be harvested when very ripe,and not off the ground more seeds will becoming avaiLable from now on and are quite cheap now. So every one can have a go in growing this lovely palm. Temp down to 3deg =35far in colder areas it would need protection (under a canopy of other palms or established garden) hope this will help . Congratulations on an almost single handed effort to conserve this species. I took these phots in Fiji at the Raymond Burr garden, where they have something like 10-20 and also have a program to preserve them. When they do seed they are quite prolific. Thanks! My wife and I also visited the Raymond Burr garden when we were in Fiji back in 2000. Spent a whole afternoon there. Beautiful place, and I'm sure it's grown up quite a bit since then. Is that Raymond Burr as in Perry Mason??,..... Ironsides? I spot all 9 Bo, can I have my prize now ? Nope! This was one of only two seeds that had fallen on the ground. They came off the plant just like that. Look at the second picture I posted. Looks like a bunch o' grenade grapes! Excellent!! Unfortunately, we have this silly "no digging" rule in our garden! yes, one and the same! Raymond Burr founded the "Garden of the Sleeping Giant" (so named after a nearby mountain that resembles a sleeping giant!) in 1977. Just type in "Raymond Burr Garden in Fiji" in Google and you get all the info you will ever want! Man...welcome to the forum! I'm glad to see you sign on and hope now to hear from you. It all looks good, the dypsis orange crush is turning out to be a real mystery. I look forward to putting on a few photos on [once I work out how to do it] and may some video footage. In 2005 when I visited there were many Verschafeltia splendida, and Pelagadoxa. Not so many Joeys, but curiously the Fiji fan palms were not as spectacular as you would expect. Theres a lot of shade in the estate and this does have an effect on the palm display. I have to add that its primarily an orchid garden, but the palms are great none the less. Your palms look great. I really like they way they are placed. Ok I think I didn't word my questions right. I was wondering if the pyramiding of that is the actual pericarp or is it is a pulp layer over the actual seed. Zac, the fruit is truly unusual. Pelagodoxa is one of my favourite fascinating palms. The corky/fleshy part is the mesocarp, while the endocarp is a brittle "skin", coating the seed. 2) But it is also "fleshy, yellow and sweetly aromatic"(Dowe & Caballion 1996), then possibly dispersed by animals (birds). 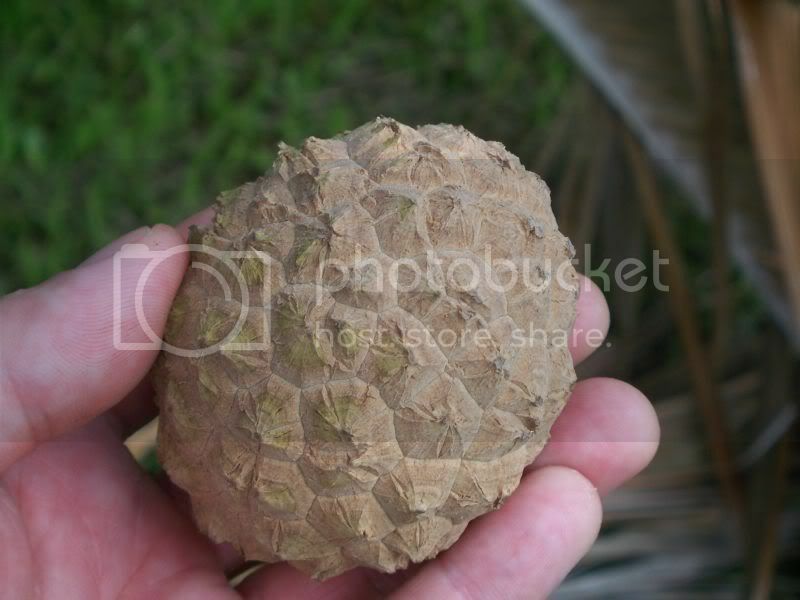 The only other diplochorous palms I could find are in the genus Pseudophoenix (Zona, 2002), with fleshy colourful sweet fruits and an air pocket that makes them float. I find it very easy to grow despite its high sensitivity to cold and drought. In my experience, in the Canary Islands, it is a very strong plant. It tolerates pot colture, pests, greenhouse heat and pH changes. I even had two great plants on the roof, at the 8th floor, in the driest hearth of the city, thriving with just some light shading. There are at least two different forms, from different archipelagoes. Future research might split it in two species or subspecies, so keep all the records you can about the origin of your plants. How do the two forms differ? Thanks Carlos. That is exactly what I was looking for. I now understand what I am looking at. The typical Pelagodoxa henryana grows in Nuku Hiva (Marquesas) and produces large fruits. 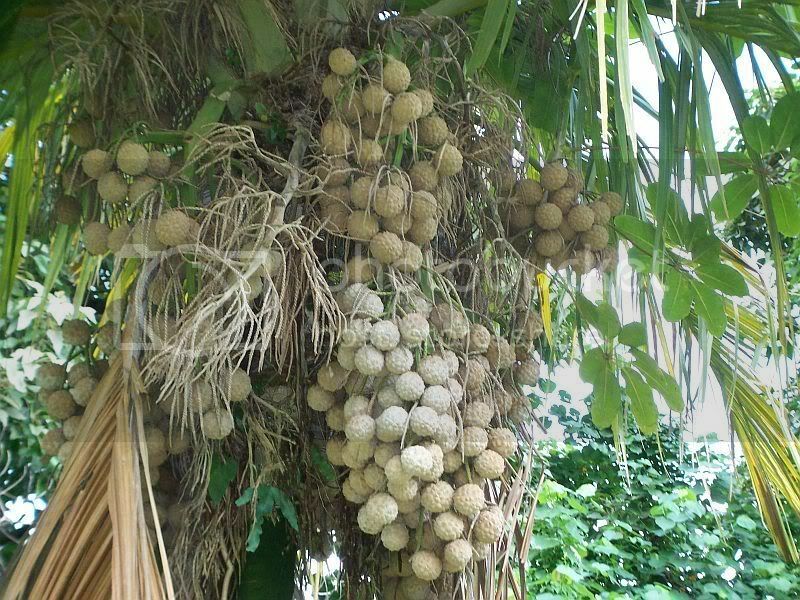 The "other" Pelagodoxa henryana grows in Solomon and Vanuatu and produces smaller fruits of about 2 cm in diameter. There must be something else besides fruit size but I do not know anything else. We need some research to be done. I have about a 100 plants that are ready to go into the ground in our farm in India. There they love the heat and seem very happy.Growth hasn't been as fast as i would want it to be - probably because they are in pots. I am looking forward to seeing them grow faster in the ground. I know they will never ever make it here in Northern CA - but for what its worth - i have one on my window sil (and several hundred in community pots) - the apple of my eye - next only to Voanioala. A lot has been written on the variance in morphology between the Vanuatu, Marquesas and the Tahitian forms. I remember reading an article recently (about 6 months ago) in either the PACSOA or NZ palm society magazines. But for its dislike to windy locations, and ofcourse the need for heat - this could be a more common palm than what it is today. Joseph- Are you growing these on the farm in India for eventual export of seeds? Just curious. Good for you, planting 100 of them. That sounds like a good sized population for seed production and species preservation. Mostly conservation. We have about 150 species right now - and quickly growing. None of them in large volumes - except my royals - of which we have a few thousands. Otherwise pretty much everything else is either in 50s or 100s. I am not so sure about seed production. Not sure if i will live long enough to see them seed :-) - but if i do - yes - that could be a possibility. But there are so many mature gardens around the world - that will be producing this in abundance - making conservation by propagation a reality. And I remember several years ago, that it was almost like dreaming if you thought someday that you could actually buy one..........and at a very affordable price! I thought I would a picture of the one in The Palm House at Kew. I remember John Bishock was selling a two leaf seedling back in the day for $75.00 at a South Florida Palm Society Sale at Fairchild Tropical Botanical Garden. People were fighting over it. I have two that made it through this winter rather unscathed. When we were first paying high prices for this palm, we did not want to chance it and see what temperatures it would take. Now that more seed has become available and the price has drpped a bit, hobbyist are taking more chances with this great palm. It may be a bit more cold hardy than orginally believed. I'll still cover mine when the low thirties come again. Pelagodoxa henryana are beautiful palms and they´re on my wish list...even the seeds are expensive! Thanks for the great pics...and, Bo, your place looks incredible, it´s such an inspiration for us guys who are just starting their collections! Ron, mine went through this years cold fronts and was not even phased. It gets some morning and late afternoon sun and seems to be happy with that. So far it appears to be a rather low maintenance palm and about the only thing that seems to phase it are winds that split the leaves up. When these things seed they are spectacular. I've got a long way to go with mine until then. Can you guys tell if this is the same palm? If it is, it has survived this far North in the frozen tundra of Central Florida!